THE newest water sport in Berlin swimming pools is handicap racing with the recently-introduced “grinding wheel” boat weighing but six pounds and measuring a yard in length. On the water speedway the racer places his head and arms in the openings as shown in the accompanying photo and proceeds to grind away toward the goal. 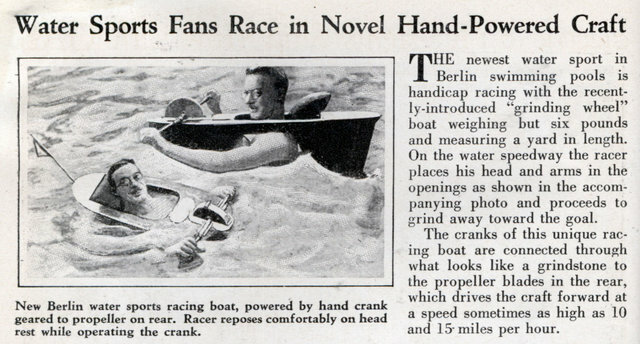 The cranks of this unique racing boat are connected through what looks like a grindstone to the propeller blades in the rear, which drives the craft forward at a speed sometimes as high as 10 and 15 miles per hour. lol it looks so wacky.